Summer is officially here (unless your children are not out of school, in which case, never mind). I think it’s easy to make enormous plans for all the awesome things you’re going to do with your kids over the summer and then lose steam about 5 minutes into the first day. You’ve probably noticed by now that my standard mode of operation is pretty low-key. The main things I plan to do with my girls is swim in my parents’ pool and read books in the air-conditioned house. I can’t help you with the pool part (sorry! ), but if you want suggestions for books to read with your kids this summer, I’m your girl. Each Monday through August, I’ll be sharing a themed booklist. It’ll include both picture books and a few chapter books for older kids to read on their own or to read aloud. I’ll also usually throw in a couple of simple activities and recipes, if you’re feeling super motivated (but if you want to skip those, there will be no judgement. I’m not saying I’ll be doing them – just that I’m including them in case you want to be more impressive than I am). 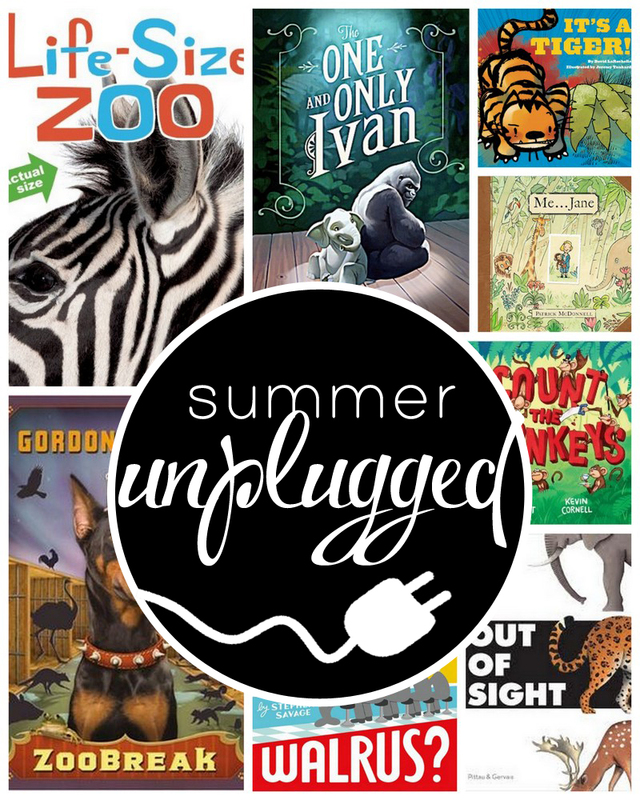 I’ll also be sharing additional books, recipes, and activities on Instagram and Pinterest (all tagged with #summerunplugged – and I’d love it if you tagged anything you’re doing this summer with it too!). Plus, each week there will be a giveaway, sometimes for your kids, sometimes for you because. . . it’s hard to be the parent when it’s 115 degrees outside. Anyway, with that enormous intro . . . . This week, it’s all animal/zoo/safari themed. Out of Sight by Francesco Pittau and Bernadette Gervais – Animals behind flaps and you try to identify them by paw prints, tails, horns, and patterns. My girls were NUTS about this book (and frankly, so was I). Count the Monkeys by Mac Barnett and Kevin Cornell – Not your basic counting book. Page after page goes by with no monkeys in sight because other scary animals keep frightening them off. The end of the book is coming up fast – will the monkeys ever return? Life-Size Zoo by Teruyuki Komiya, Toyofumi Fukuda and Kristin Earhart – You will not BELIEVE how long a giraffe’s tongue actually is. Carnivores by Aaron Reynolds and Dan Santat – Carnivores in the wild aren’t exactly popular. Is it possible for a lion to change his diet? Me. . . Jane by Patrick McDonnell – This very simple, early biography of Jane Goodall is just 100% darling. Xander’s Panda Party by Linda Sue Park and Matt Phelan – If you’re planning a party for bears, does a koala bear get an invite? It’s a Tiger by David LaRochelle and Jeremy Tankard – I think this was the most read book in house last year. It’s funny, the illustrations are spot-on, and it’s ideal for reading aloud. A Zeal of Zebras by Woop Studios – Any idea what you call a group of sharks? How about starfish? How about pandas? Chloe and the Lion by Mac Barnett and Adam Rex – Chloe is on her way from school and is waylaid by a lion. But wait . . . the author and illustrator can’t agree on what terrifying animal it should actually be. Where’s Walrus by Steven Savage – This is one of my all-time favorite wordless picture books. Zoobreak by Gordon-Korman – This adventure series was so ridiculously popular at the elementary school libraries I ran in Boston, I don’t think they stayed on the shelf more than 30 seconds the whole year. Thanks for these. I'm always on the hunt for good chapter books for my 8 year old son, so this will be perfect! Plus, the picture books will be great for my 5 and 3 year old. Great idea! Even though I work I might still do some of this stuff with my preschooler on the weekends. Perfect! We're having a zoo-themed combined birthday party this summer so this will get the kids in the spirit. Love ALL these books. The only one I haven't read yet is Zoobreak. I'll put it on my list. Thank you so much for this summer unplugged series. Wish I had a pool to toss the kids in every day. It's not hot enough for outdoor pools here until Aug.